MOORESVILLE, N.C. (Feb. 5, 2019) – Kyle Busch Motorsports (KBM) announced today that Christian Eckes will return to the organization in 2019 with an expanded NASCAR Gander Outdoors Truck Series (NGOTS) schedule. Eckes will drive the No. 51 Tundra in seven NGOTS races this season including the season-opening event at Daytona (Fla.) International Speedway, where he will be sponsored by SiriusXM – the world’s largest radio company, and the season finale at Homestead-Miami (Fla.) Speedway. Eckes posted three top-10 finishes across four NGOTS starts driving KBM’s fourth entry, the No. 46 Tundra, in 2018. He had an impressive run at Gateway, where he qualified second, led 34 laps and won Stage 2 before being taken out in a mid-race accident while running inside the top five. The Middletown, N.Y., native collected his first career ARCA Racing Series victory at Salem (Ind.) Speedway last April after leading 72 laps of the 200-lap event, including the final 52 circuits and was also victorious in August on the dirt track at Illinois State Fairground in Springfield and at Lucas Oil Raceway in Indianapolis, Ind. in October. In addition to his three wins, he recorded two poles, 420 laps led, six top-five and eight top-10 finishes across 13 ARCA Racing Series starts in 2018. Overall in 27 career ARCA Series starts, Eckes has posted three wins, two poles, 694 laps led, 10 top-five and 18 top-10 finishes resulting in an average finish of 8.3. The talented teenager put his name on the motorsports map when he won the prestigious Snowball Derby Super Late Model race at Five Flags Speedway in Pensacola, Fla., in December of 2016. The then 15-year-old battled side-by-side with John Hunter Nemechek for the final two laps before narrowly edging him to the finish line. The Snowball Derby win was part of a three-race winning streak in Late Models to close out the 2016 season after the teenager was victorious in the Myrtle Beach 400 Late Model Stock event at Myrtle Beach (S.C.) Speedway and the Thanksgiving Classic All-Star Super Late Model race at Southern National Motorsports Park in Kenly, N.C. The 18-year-old driver’s 2019 NGOTS schedule will also include events at Gateway Motorsports Park in Madison, Ill. June 22, Pocono (Pa.) Raceway July 27, Las Vegas (Nev.) Motor Speedway Sept. 13 and Martinsville (Va.) Speedway Oct. 26. Sponsor announcements for the remainder of Eckes’ seven-race schedule are forthcoming. 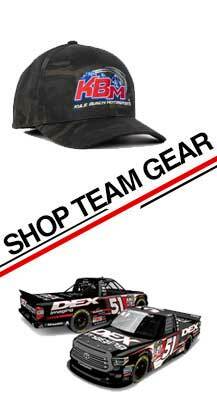 Since debuting in 2010, Kyle Busch Motorsports (KBM) has quickly established itself as one of the most successful teams in all of NASCAR. Owned by 2015 Cup Series champion Kyle Busch and fueled by his passion for winning, the organization holds the Gander Outdoors Truck Series records for most career wins (66) and most wins in a single season (14 in 2014). In addition to collecting a series-record six Owner’s Championships, the organization has produced two championship-winning drivers; Erik Jones (2015) and Christopher Bell (2017). KBM prepares a fleet of race-winning Toyotas out of its state-of-the art 77,000-square-foot facility in Mooresville, N.C. Fans can stay up-to-date with all the latest KBM news online at www.KyleBuschMotorsports.com, by liking the team on Facebook (KBMteam) and by following the team on Instagram (KBMteam), Snapchat (KBMteam) and Twitter (@KBMteam).